The earthquake was "like Doomsday" according to Abdul Mahroof who huddles inside a rug against the cold at the earthquake-devastated town of Balakot, in Pakistan's North West Frontier Province. 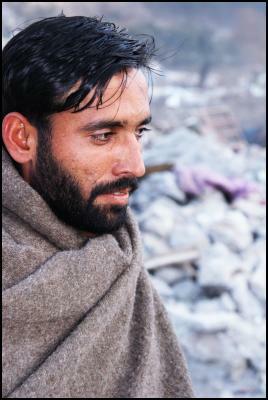 Abdul Mahroof, who is shivering, lost 11 members of his extended family in the quake including his three-year old daughter Shanzadea. A tailor by trade the 24 year old lost his workshop a means of living during the quake. He pulls his blanket tightly around him in the freezing temperatures. At night, temperatures plummet, and many survivors have inadequate clothing and shelter. Oxfam spokesman Idrees Khan says many survivors will need help not only dealing with the immediate threat of a harsh Himalayan winter but the long-term challenge of rebuilding their livelihoods and communities. Thanks to an Asia New Zealand media award NZ journalist Jon Stephenson was able to travel throughout earthquake affected Pakistan just prior to Christmas. 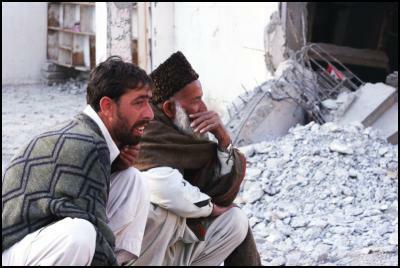 Local men survey the ruins of their neighbourhood at Balakot, in Pakistan's earthquake devastated North West Frontier Province. 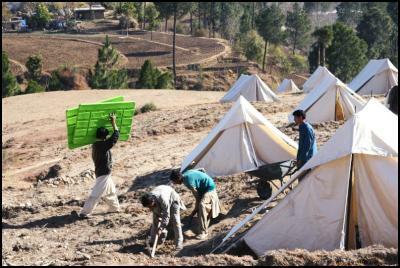 At an Oxfam camp near Mansehra, in Pakistan's North West Frontier Province (NWFP), aid workers erect a tent village for earthquake survivors. 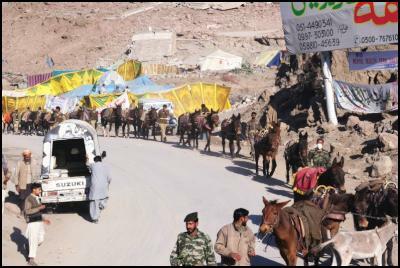 An Oxfam spokesman, Idrees Khan, says work on the tent villages is progessing well, but aid agencies will need more funding if they are to deliver shelter and supplies to around 350,000 homeless people in the NWFP - many of whom are still in badly damaged villages in mountainous regions. 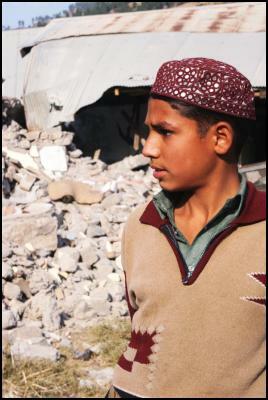 A local boy surveys damage in the earthquake-devastated town of Gari Habibullah in Pakistan's North West Frontier Province. Around 500 of Gari Habibullah's 15,000 residents were killed in the magnitude 7.6 earthquake, which struck the region on 8 October. 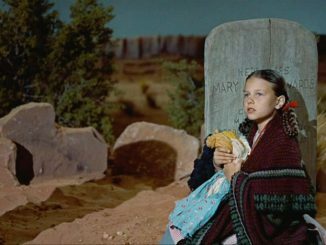 The dead included 300 school children. Many of the survivors remain without adequate shelter or supplies of food. A temporary camp for homeless people set up at Balakot in Pakistan's earthquake-devastated North West Frontier Province. Balakot was among the areas worst affected by the magnitude 7.6 quake, which hit the northern part of Pakistan on 8 October. 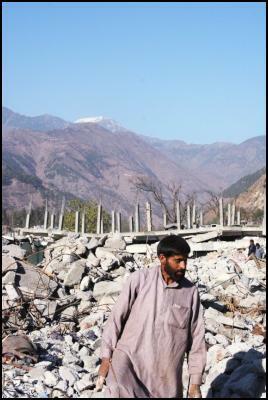 A local man inspects earthquake wreckage at Balakot, in Pakistan's North West Frontier Province. Winter is setting in, and snow has already fallen in the nearby mountains where as many as 350,000 homeless Pakistanis remain. Pakistan's government and local and international aid agencies are racing against the clock to deliver food and shelter to these villagers so they can survive the Himalayan snows and temperatures that can drop as low as -20 degrees Celsius. Pakistani soldiers return to the city of Balakot, in Pakistan's earthquake-stricken North West Frontier Province, after taking aid to remote villages. While Pakistani and international military and civilian helicopters are at the forefront of relief efforts, a lot of aid is being delivered to remote areas by truck, donkey and even by hand. 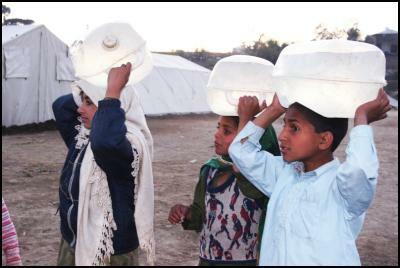 As the sun sets at a refugee camp near Balakot, in Pakistan's North West Frontier Province, children carry water to their tents. 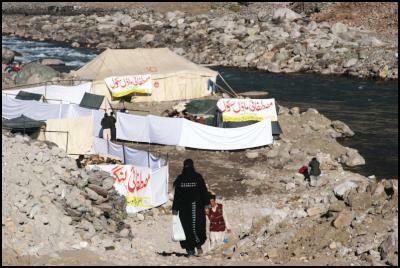 Facilities in such camps vary. 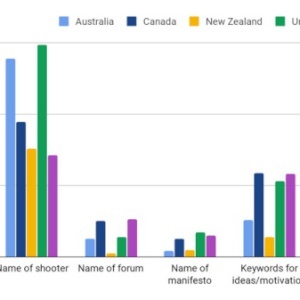 Some are well-designed and constructed, while others are relatively basic. Aid agencies fear the cramped conditions in some of these "tent villages" may lead to the spread of disease, but most inhabitants will survive the harsh winter. 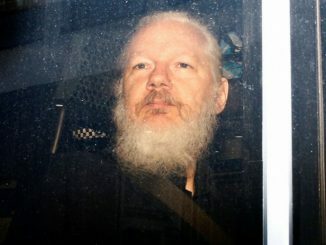 Jon Stephenson is a freelance NZ journalist who spent 100 days criss-crossing Iraq during 2004 and sending stories back for the Sunday Star-Times newspaper - included in these stories was an interview with the then Iraqi Prime Minister Iyad Allawi. More recently Mr Stephenson's coverage of Iraq and Israel's withdrawal from the Gaza Strip has appeared in Metro magazine. Mr Stephenson was accompanied on his tour of quake stricken Pakistan by BFM host Rebecca Wright.